Begin Simply: This shirt is a keeper, so is the skirt! This shirt is a keeper, so is the skirt! S E V E R E.
By now, you already know my love of creating shape by just simply tucking the hem here or tucking the hem there. The emphasis is on the ability to change an outfit ever so slightly while still creating an affect. It is definitely NOT to look prim and proper, quite the opposite actually as the 'tucks' I like give an outfit a relaxed and slouchy viewpoint. Given what I said, I would probably choose the half-tuck, right? So, why the jump out of my 'tucking' comfort zone? I could't give you an answer myself, it is one of those times when you end up trying something different. In my opinion, I love how it turned out. I can not quite pin point it, but even though all three elements, the shirt, skirt and tuck all scream structure the overall outfit is not as severe as one would conclude. Maybe the rolled sleeves? The tailoring of the shirt? The A-line and wrap detail? Or, it just might be my view! You're right--these pieces fit together perfectly, and the shape of the entire look is just right. 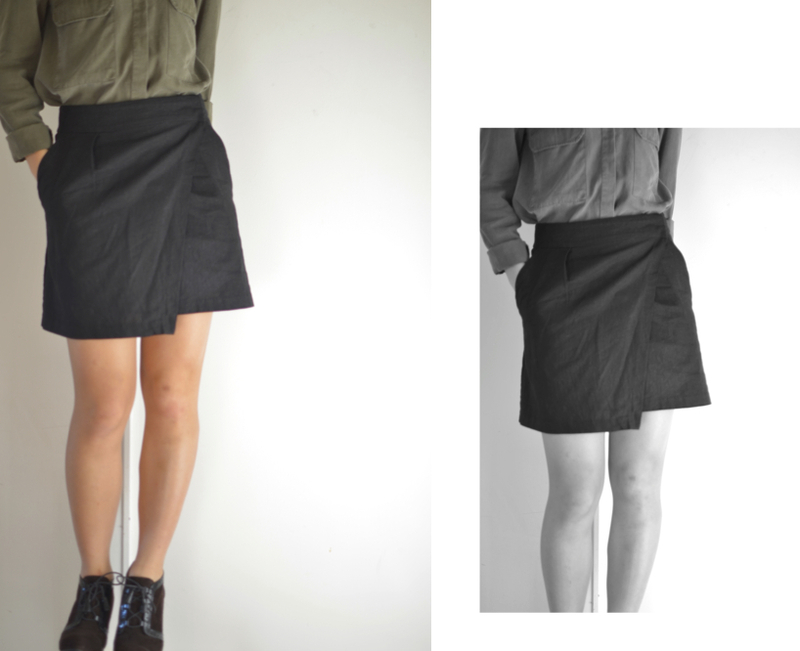 This skirt is probably one of my favorite pieces from your wardrobe! Thank you! Falling in love with this skirt, too. Basic but ever so slightly different to just a black skirt. it all works well on you. It's the rolled-up sleeves! A sliver of wrist/ankle makes everything better. Yes - I think it's the rolled up sleeves and the light weight of the shirt! I also love the skirt on you - a good acquisition. Thank you, Rachel! I'm really happy the skirt easily transitions with my wardrobe.